Fire safety systems and equipment market are necessary equipment which have to be installed at different places of the buildings to ensure the safety and for the prevention of major loss due to fire. The demand for fire safety systems and equipment in Africa is projected to grow in future as these equipment are installed in almost all the sectors. Oil & Gas and tourism being the major sectors for many African countries spurs the Africa fire safety systems and equipment market forecast period revenues. According to 6Wresearch, Africa fire safety systems and equipment market size is projected to grow at a CAGR of 10.2% during 2017-23. Africa Fire safety systems and equipment market is anticipated to grow in the projected period with the revival of economy and stable political conditions in the African countries. South Africa has the most stringent fire prevention and protection codes in comparison to other African countries, thus the region held majority of the Africa fire safety systems and equipment market share. However, codes related to fire safety are also followed by other countries such as Algeria, Egypt, Morocco, Tunisia and others. Growing tourism sector in South Africa, Morocco, Egypt and Tunisia is a major driver for the growth of Africa fire safety systems and equipment market, which is driving the installation in hospitality and retail sectors. Some of the key players in Africa fire safety systems and equipment market include- Tyco, Honeywell, UTC, Bosch, Hochiki and Viking. The Africa fire safety systems and equipment market report thoroughly covers the Africa fire safety systems & equipment market by types, verticals and countries. 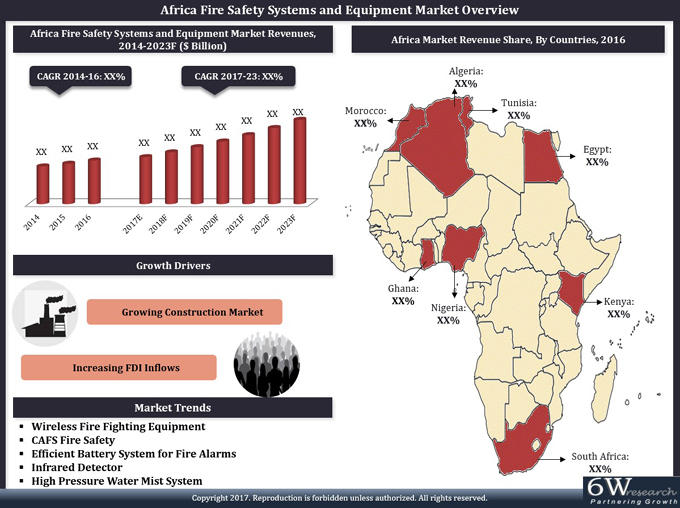 The Africa fire safety systems and equipment market outlook report provides an unbiased and detailed analysis of the on-going Africa fire safety systems and equipment market trends, opportunities high growth areas, market drivers which would help the stakeholders to device and align their market strategies according to the current and future market dynamics. • Historical Data of Africa Fire Safety Systems and Equipment Market Revenues for the Period 2014-2016. • Forecast Data of Africa Fire Safety Systems and Equipment Market Revenues for the Period 2014-2016. Market Forecast of Revenues until 2023. Safety Systems and Equipment Market Revenues for the Period 2014-2016. Fire Safety Systems and Equipment Market Revenues until 2023. Fighting Systems and Equipment Market Revenues for the Period 2014-2016. Fire Fighting Systems and Equipment Market Revenues until 2023. Detection and Alarm Systems Market Revenues for the Period 2014-2016. Fire Detection and Alarm Systems Market Revenues until 2023. Safety Systems and Equipment Market Revenues by Verticals for the Period 2014-2016. Fire Safety Systems and Equipment Market Revenues by Verticals until 2023. Safety Systems and Equipment Market Revenues by Regions for the Period 2014-2016. Fire Safety Systems and Equipment Market Revenues by Regions until 2023. • Africa Fire Safety Systems and Equipment Market Trends and Developments. • Africa Fire Safety Systems and Equipment Market Overview Competitive Landscape.